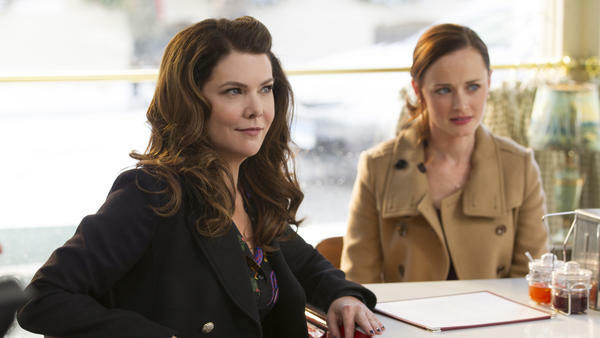 Lauren Graham and Alexis Bledel return for four movies continuing the Gilmore Girls story. Most television shows arrive accompanied by the question, "Is it good?" Revivals of old shows, however, often arrive with the question, "Is it necessary?" The four new 90-minute installments of Gilmore Girls that arrived Friday on Netflix under the title Gilmore Girls: A Year In The Life fare better by that adjusted standard than most. Gilmore Girls, which ran from 2000 to 2007, was a good show, and because creator Amy Sherman-Palladino left before the seventh and final season following a contractual dispute, she didn't get to end it the way she wanted to. Moreover, the reason to watch Gilmore Girls was always to spend time in its constructed universe, observing the relationships it built, and listening to its stylish dialogue and its "la-la-la" music. Most of the frustrations were around plot developments, in fact; most of the pleasures came from being in the characters' company. To be in their company again feels very much like television's closest approximation of the same holiday catch-up that happens in real life — that's one of the reasons the Thanksgiving weekend release is such clever timing. We don't find Lorelai Gilmore (Lauren Graham) and her daughter Rory (Alexis Bledel) where we left them in 2007. The original series followed Lorelai from the 32-year-old mom of a 16-year-old to the almost-40 mom of a college graduate, and now Lorelai is pushing 50 and Rory is a grown, published writer. Time has been allowed to pass in their lives, and in the lives of everyone they knew. The biggest change in Gilmore world is that Lorelai's father, Richard, has passed away like Edward Herrmann, who played him. This leaves Lorelai's mother, Emily — beautifully performed without so much as a dropped beat by the divine Kelly Bishop — to find a path forward without her husband of 50 years. As much as Herrmann is missed, and he is missed, the mother-daughter relationships between Emily and Lorelai and Lorelai and Rory have always been the best reason to watch Gilmore Girls. Sherman-Palladino, like any good writer, uses the grief that can't be avoided to tell new stories and to push particularly Lorelai's relationship with her mother to new places. And that, again, plays to the show's longtime strengths: other shows had snappy dialogue and other shows embraced quirky small towns, but very few writers cared about moms and daughters with the depth and focus that Sherman-Palladino did. It's sort of funny, then, that so much of the chatter around the revival has been around revisiting the long-arc love story of Lorelai and Luke, and — inevitably — squabbling over the prospects of Rory's assorted disappointing boyfriends. For many women, the expectation that if you're single at the end of college, you are destined to either remain so or return to a man you already know would be alarming. But for Rory, there's a lot of fan talk about preferences as between Dean (the nice-guy first boyfriend turned disastrous affair), Jess (the rebellious second boyfriend), and Logan (the rich Yalie boyfriend). All return for the revival, but not in equal measure. As in life, some ghosts hang around, and some do not. I wouldn't dream of giving away the game here, but I will say that my own sympathies regarding The Legion Of Disappointing Boyfriends are not the same as they were when all these young men were younger men. And that's true to life, as well. Sherman-Palladino has always been an idiosyncratic creator; that's what makes her work special. The bargain, though, is that every idiosyncratic creator will baffle you at some point with an offbeat idea that seems not to belong. There are a couple of those sequences here, particularly in the middle two segments, "Spring" and "Summer," both of which have their writing and direction credited to Sherman-Palladino's husband, Daniel Palladino (the two collaborated on the original show as well). Some of these are easier to forgive given that they seem to arise from efforts to use guest stars well — particularly Sutton Foster, who starred in Sherman-Palladino's short-lived but dearly missed series Bunheads and who shows up in Stars Hollow under circumstances that it would be impolite to spoil and that, frankly, don't matter very much. There are actually a number of Bunheads-related sightings, which is entirely consistent with the truism that whatever else is said about Sherman-Palladino's work, it's never less than fully transparent how dearly she loves it and how personally she takes it. In fact, that's one of the reasons it's good to see her wrap up this story as she intended, even independent of whether it entirely pleases you or not. A friend of mine coined the term "anticippointment" to describe the way eagerness to return to a show like this often gives way to a realization that it couldn't quite give you everything you hoped for. This revival is not immune. Four 90-minute episodes amount to about the same running time as maybe eight and a half vintage Gilmore Girls episodes, or a little more than a third of a season. And in that third of a season, they have seven seasons of history to acknowledge, ignore, recall, or expand upon. They've also got to establish what's happened in the last nine years, complete three major storylines (Lorelai's, Rory's and Emily's), and perform a lot of what's derisively known as "fan service" — giving the people what they want. The people want to see Mrs. Kim again, and Babette, and Kirk, and if those names aren't meaningful to you, this revival probably isn't intended for you, particularly. The good news is that if you're not a Gilmore Girls person and your relatives are eager to watch it over the holidays, there's plenty of that staccato dialogue and family playfulness to entertain and divert you. It just won't resonate the way it might if you've been watching since Rory wore her private-school uniform and formed her first friendships. Netflix brings back "Gilmore Girls" today. There are four new "Gilmore Girls" movies, which brings back the television series from years ago and excites many "Gilmore Girls" fans. To talk about the deep love for the show, we're joined by NPR pop-culture correspondent Linda Holmes - is in our studios. Hi, Linda. LINDA HOLMES, BYLINE: Hi, Steve. INSKEEP: Are you among those who love this program? INSKEEP: Again and again and again - are these the kind of things that bear watching more than once? HOLMES: They do bear watching more than once because the reason people loved this show in a lot of ways was the way that the people in the show talked, right? It's about this small town and this mother and her daughter. And the way that all these people talk to each other is a very stylized, musical, rhythmic kind of dialogue. And I brought a little bit of that for you to listen to. LAUREN GRAHAM: (As Lorelai) Now, look, Rory, I know you've never really dated. BLEDEL: (As Rory) What are you talking about? I've dated. GRAHAM: (As Lorelai) Who did you date? GRAHAM: (As Lorelai) You and Dean did not date. You had a relationship. BLEDEL: (As Rory) Well, Jess. GRAHAM: (As Lorelai) Was relationship number two. BLEDEL: (As Rory) So maybe I've never dated. But you haven't, either. GRAHAM: (As Lorelai) I have dated at least once. BLEDEL: (As Rory) You had me with dad - relationship. BLEDEL: (As Rory) Max - relationship. Dad again - relationship. GRAHAM: (As Lorelai) OK, fine. I may not be the world's best dater. But I do it. And you should give it a shot. I mean, you're in college now. What else is there to do in college but date? BLEDEL: (As Rory) I'm going to go wash my clothes now. GRAHAM: (As Lorelai) Wait. Was that it? Is this conversation over? Sorry, did I win? HOLMES: So that's Lorelai Gilmore, the mother, talking to her daughter, Rory, who she had when she was 16. So she's a young mom. INSKEEP: I love it. It's like staccato sentences, like an old Humphrey Bogart movie or a film noir. But it's women talking. HOLMES: That's what people really love about this show - is the dialogue. So to bring it back and give people an opportunity to hear all these people talking to each other again is really lovely. INSKEEP: Is it still relevant years and years - it was nine years since this thing has been around. HOLMES: Yeah, it is relevant. And I think it has a better reason to come back than most because the creator of the show, Amy Sherman-Palladino, who wrote a lot of that wonderful dialogue, left the show before the final season. So she never got to really wrap it up on the terms she wanted. So this is an opportunity for her to have the ending that she envisioned. It's a little different 'cause it's happening when they're older. But it's still the ending that she envisioned. INSKEEP: So what happens then in these new four movies? HOLMES: Well, you get to check in with Lorelai and with Rory. And, you know, it started off when Lorelai was, you know, an early-30s mom, and Rory was a high-school student. Now they're kind of both adults. And they both have adult problems. Edward Herrmann, who played Lorelai's father - wonderful actor - has passed away since the show ended. So the death of that character is also brought into these movies. And you get to see how that's affected Lorelai's mom. And those mother-daughter relationships - Lorelai and her mom and then Lorelai and her daughter - were always kind of the emotional engine of the show. And that's really still at the center. INSKEEP: I'm liking the idea of letting the characters get a little bit older because it's reminding me of the movie "Boyhood," where the characters go over a dozen years. HOLMES: There is a sense of that. And you do get an opportunity to check back in with these people and kind of see what's happened since then and how they've matured and changed or haven't changed. INSKEEP: So does it work? HOLMES: It does work. People will quibble about, you know, how much time do you spend with these people, catching up with them versus - there's so many characters in this town. People will quibble about where the time is spent. But I think, ultimately, the core of it is well worth revisiting. You know, Netflix has revived a bunch of series - "Arrested Development" and "Full House." And there's a bunch of different efforts like this. This, to me, is one of the better and more satisfying ones. INSKEEP: Well, Linda Holmes, I'm going to spend the rest of the day going around talking in very short sentences. INSKEEP: Thanks. Sounds good. Glad you came by. That's NPR's Linda Holmes. CAROLE KING: (Singing) If you need me to be with you, I will follow... Transcript provided by NPR, Copyright NPR.